Graves died of an apparent heart attack outside his Los Angeles home, publicist Sandy Brokaw told the Associated Press. He had just returned from having brunch with his family when he collapsed, Brokaw said. Although one of his daughters administered CPR, she was not able to revive him. 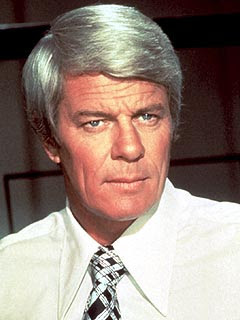 Graves's most famous role is perhaps that of Jim Phelps, who led a group of special agents who undertook dangerous – and seemingly impossible – missions in the long-running TV series Mission: Impossible. Younger audiences may remember him best as the wacky pilot in the 1980 comedy Airplane and Airplane II: The Sequel. The actor was born Peter Aurness in Minneapolis and served in the Army Air Forces in 1944-1945, before going to study drama at the University of Minnesota as part if the G.I. Bill of Rights. His older brother, James Arness of Gunsmoke fame, was already working in Hollywood when Graves made the move, too. Graves, who had classic good looks, was often cast as the hero in movies. However one of his most memorable early roles was a Nazi spy in Billy Wilder's 1953 prisoner-of-war drama Stalag 17. He is survived by his wife, Joan Graves, who he met in college, and three daughters, Amanda Lee Graves, Claudia King Graves and Kelly Jean Graves.